Taste Of Atlanta | TA Live! Taste of Atlanta 2014 was a success this past weekend with the sun shining and tons of amazing food from all over the city! 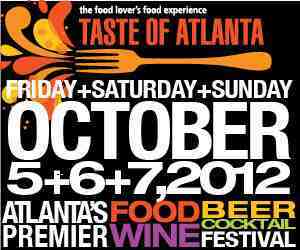 TALive Weekend Picks 10/24-10/26: including Taste of Atlanta, Owl-o-ween, Bill Cosby and more! Photos By: Adam Davila Ticket Alternative had a blast helping Taste of Atlanta celebrate their 12th year this past weekend on October 25, 26 and 27 at Tech Square! What a successfully tasty event it was! Check out our photo album of everyone having a delicious time! TA Live Weekend Picks: Taste of Atlanta, Owl-O-Ween, & More! Fall Into The New Season With Fun Festivals, Events & Activities! Ticket Alternative Weekend Picks! Taste of Atlanta, Frightened Rabbit, Mac Powell, & More! Join Taste of Atlanta and host Chef Ford Fry as we kick off the weekend with a block party for the record books. To help get you fired up for the festival weekend, many of Atlanta’s favorite grill masters will be dishing out their most mouth-watering bites. The all-inclusive party features live music from Yacht Rock Schooner, wine, beer, American Spirit Whiskey cocktails and more at this all-inclusive kick-off event! Ladies and Gentlemen the kings of Reggae are hailing in Florida this weekend! Bob Marley would be proud! Taste of Atlanta is Here! October 5th, 6th, and 7th! Prepare to Feast! Several Ticket Alternative Atlanta Venues & Event Partners Receive “Best of Atlanta 2012” from Creative Loafing!